Senior Western officials accused Russia yesterday (19 February) of redrawing the map of Europe by force and posing a threat to the Baltic states. Russian President Vladimir Putin was a “real and present danger” to Estonia, Latvia and Lithuania and NATO was getting ready to repel any aggression, British Defence Secretary Michael Fallon said. Valdis Dombrovskis, Vice-President of the European Commission, said a stronger NATO presence was needed on the alliance’s borders. “Russia’s aggression against Ukraine is very worrying for Baltic states,” Dombrovskis, a former prime minister of Latvia, said at an event in London. Fallon, whose remarks were published as Britain scrambled jets to see off Russian Bear bombers, said Putin could launch a campaign of undercover tactics to try to destabilise the three former Soviet republics, all now members of NATO. “I’m worried about Putin,” Fallon told the Times and Daily Telegraph newspapers, saying there was “a very real and present danger” Russia would adopt the same tactics it used to unsettle eastern Ukraine and Crimea. “I’m worried about his pressure on the Baltics, the way he is testing NATO. NATO has to be ready for any kind of aggression from Russia whatever form it takes. NATO is getting ready,” he said. Russia bridled at the remarks. “The comments of Mr Fallon of course are already beyond diplomatic ethics and the characterisation of Russia is completely intolerable,” Foreign Ministry spokesman Alexander Lukashevich told reporters. Fallon’s intervention came as fighting raged in eastern Ukraine despite European efforts to resurrect a stillborn ceasefire, a day after pro-Russian separatists forced thousands of government troops out of a strategic town. 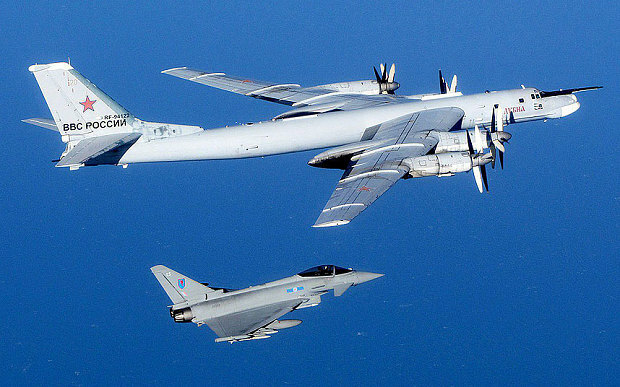 Fallon also raised concerns about increased Russian air activity around Britain as his ministry announced the Royal Air Force had escorted two Russian long-range Bear bombers away from the south coast of England the previous day, the second such incident in as many months. Prime Minister David Cameron said he thought the Russians were trying to make “some sort of a point”, but that he didn’t deem it necessary to dignify it with too much of a response. Fallon earlier this month said Britain would send four Typhoon fighter jets again this year to help NATO with air policing in the Baltic states, promising up to 1,000 British troops would also join a NATO rapid reaction force. Speaking in Madrid, Foreign Secretary Philip Hammond said Russia needed regularly reminding that there were “red lines” around NATO members such as the Baltic states backed up by the alliance’s article 5 collective defence guarantee. Lithuanian Foreign Minister Linas Linkevi?ius said Russia posed a threat to the wider region, including Moldova, which on Wednesday chose a pro-European businessman as prime minister. Latvian finance minister Jnis Reirs told Reuters his country had detected elements of “hybrid warfare” in the past year and was aware that Moscow could try to use the Baltics to destabilise Europe. Georgia meanwhile condemned the signing of a border agreement between its breakaway region of South Ossetia and Russia, accusing Moscow of moving closer to annexing a territory it supported in a five-day conflict in 2008. Georgia, which has ambitions to join NATO, and Russia fought that war over South Ossetia and another separatist region, Abkhazia. After it ended, Moscow recognised both regions as independent countries. We do not see this at all. During the 1960s the then rulers of the then USSR put weapons in Cuba. The USA seeing this as being an issue decided to blockade Cuba. 50 years later the USA – UNDER THE PRETEXT OF NATO, ALL NATO BASS ARE AMERICAN BASES. has been attempting to put USA BASES ALL AROUND RUSSIA AND AS A RESULT OF THE MEDDLING IN THE OLD EASTERN BLOC COUNTRIES HAS SUCCEEDED. Is it surprising therefore that as these bases are full of AMERICAN ARMOUR AND MISSILES THE RUSSIANS SEE THIS AS A THREAT? The USA cannot survive unless it continues to manufacture armaments. Now with Afghanistan and Iraq no go areas it is looking for another issue.